In retrospect, it sounds like a dream come true: a mobilized population, intercontinental organizing, cooperative left-wing governments — all culminating in the downfall of a major corporate-friendly trade agreement that would have covered a large chunk of the global economy. It wasn’t just a dream. The proposed Free Trade Area of the Americas, or FTAA — meant to span all of North and Latin America — went down in defeat in 2005. Now, over a decade later, as we face two other upcoming trade deals — the Transpacific Partnership (TPP) uniting 12 Pacific Rim countries, and the Transatlantic Trade and Investment Partnership (TTIP) connecting the United States and Europe — the FTAA victory has a lot to teach us about successful social movement strategies, and the challenges of building and sustaining power. In 1994, Western hemisphere elites were riding high. The North American Free Trade Agreement, or NAFTA — which stitched the United States, Canada, and Mexico into a trade bloc — had been signed in January. By December, delegates at the first Summit of the Americas came up with a new, even more ambitious plan. Meeting in Miami, the presidents from 34 countries (every nation in the Americas except Cuba) resolved to create what U.S. president George H.W. Bush had envisioned in 1990 as a “free trade zone stretching from the port of Anchorage to the Tierra del Fuego.” With a market of 800 million consumers and a GDP of $11.5 billion — 40 percent of the world’s total at the time — the FTAA promised to become the largest free trade area in the world. Those assembled decided to begin negotiations in earnest, with the aim of making FTAA a reality by 2005. Having seen the problems with NAFTA — which included major labor dislocations and new legal mechanisms that undermined all manner of consumer and environmental protections — civil society organizations were concerned. As they began to get access to draft chapters of the FTAA, their analyses pointed to grave implications for food security, the availability of medicines, water, and basic services, and access to scientific knowledge itself. One of the biggest concerns was the investment chapter of the FTAA. Just like NAFTA’s Chapter 11, it granted expansive new rights to foreign investors, which they could enforce through the now-infamous Investor-State Dispute Settlement Mechanism (ISDS). That system allows corporations to bypass national courts and sue countries directly in private international arbitration tribunals when they feel that their investments — and profits — are being affected by a public policy. Social organizations considered this a direct attack on sovereignty and democracy. Controversy over ISDS bolstered the popular perception that this was not an agreement for trade or integration based on the common good, but rather an expansionist project into Latin America — with its huge consumer market and immense natural resources — based on the commercial and corporate interests of the United States. The consequent mobilization against the deal was enormous and decisive. At the fourth Summit of the Americas, held in Mar del Plata, Argentina in November 2005 — the very year in which the FTAA was supposed to be inaugurated — the proposed trade deal was pronounced dead. While the social organizations’ analysis of the proposed trade agreement might have been on point, it’s a big leap from robust critique to outright victory. What strategies did social movements use? The first was to construct a diverse yet united movement with a common goal. 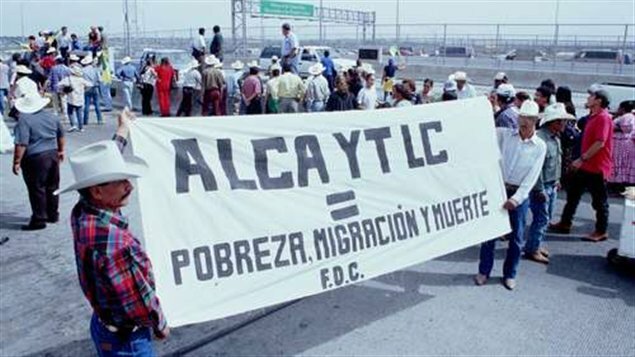 Building on the experience and the networks created through U.S., Mexican, and Canadian organizing against NAFTA, the movement began to coalesce during the late 1990s into the Hemispheric Social Alliance, or HSA. The alliance united diverse sectors — including indigenous, labor, student, environmental, and women’s movements, as well as sympathetic NGOs and others — from across North and Latin America. Among the HSA’s most important activities were People’s Summits, scheduled to coincide with rounds of FTAA negotiations. These were popular assemblies where discussion could happen and strategic lines of struggle could be defined. The summits pushed the movement to develop a common agenda and construct a common language. According to participants, one very important decision was to concentrate on what members found agreement on, and leave areas of disagreement open for discussion. The summits were also moments for filling the streets of the host cities with debate and color — and for dialogue with local people about the ways in which the FTAA was going to affect their lives. By closely examining the impact of prior trade agreements such as NAFTA, and the drafts of the proposed FTAA text, the HSA grounded its opposition to the deal in high quality analysis. But in order to persuade the public, this had to be accompanied by effective campaign messaging. “No to the FTAA!! Yes to Life!! Another America is Possible! !” became ubiquitous across the region — from the banners displayed in demonstrations to buttons, hats, and pamphlets distributed in the streets. Also important was the ability of the alliance to propose alternatives. The movement wasn’t opposed to the integration of the Americas. Rather, underlying the “Alternative for the Americas” proposal was a vision for an alternative to neoliberal integration based on principles of democracy, sovereignty, social wellbeing, equality, and sustainability. By 2005, the regional balance of power had shifted, and progressive governments — in response to sustained social movement pressure — were changing their positions. Despite the efforts of President George W. Bush to resuscitate the agreement in Argentina, the summit that year marked the death knell for the FTAA. The social movements had won a major victory and celebrations took over the streets. There was plenty for the social movements to rejoice about. But organizers were neglecting at their peril the scope of challenges to come. It didn’t take long to see that corporations and free-trade oriented governments had designed a new way to expand the system. Undaunted by the setback, corporate interests shifted strategies, moving ahead with bilateral and other multilateral free trade agreements, or FTAs. For example, the United States signed FTAs with Chile, Peru, Colombia, and Panama, as well as with a bloc of Central American countries and the Dominican Republic (DR-CAFTA). Similarly, the EU signed an FTA with Mexico in 2000. Then, after its failure to negotiate a free trade agreement with the Andean Community of Nations, it signed FTAs with Colombia and Peru. Initially, only the countries most open to neoliberal economics — Chile, Peru, Colombia, and Central American nations — agreed to this new wave of FTAs. In contrast, those countries where leftist governments had maintained close alliances with social movements in the fight against FTAA — Venezuela and MERCOSUR nations such as Argentina and Brazil — stayed away. But over time, even those latter countries have begun to accede to corporate power. Strikingly, Ecuador — formerly a very vocal critic — joined Colombia and Peru’s FTA with Europe. Brazil — the one country in Latin America that for years had avoided entering bilateral trade agreements — signed- an [FTA with Mexico>http://www.wsj.com/articles/mexico-and-brazil-agree-to-expand-their-bilateral-trade-1432685835], and is moving toward others. MERCOSUR (consisting of Argentina, Brazil, Paraguay, Uruguay, and Venezuela) and Brazil are negotiating a free trade accord with the European Union. Opportunities for corporations emerge in particular when social movements lose their strength. With all of these free trade agreements being signed across the region, it’s worth asking: What happened to the social movement that only a short while earlier had defeated the FTAA? Having lost both its international unity and its independence from left-wing Latin American governments, the movement was prepared neither for the corporate counteroffensive nor for sustaining itself during periods of decline. By 2016 it’s become clear that big inter-regional agreements — combined with new bilateral trade and investment deals — are the most prominent way to write the rules of the global trade system in the 21st century. What the United States and Europe couldn’t do within the World Trade Organization or with the failed Multilateral Agreement on Investmentin the 1990s, they’re doing country by country, region by region. Now comes the real moon shot. If the TPP and TTIP are fully implemented, they would cover 60 percent of global GDP and 75 percent of global trade, as the Transnational Institute’s Susan George indicates. A cohesive trans-continental social movement like the kind that coalesced around the FTAA is unlikely to form again. But current movements fighting trade agreements can draw important lessons from the anti-FTAA movement. As we engage in these struggles, what does the successful FTAA campaign tell us about how to build power in our respective domestic contexts? One lesson is to harness the power of groups that are already mobilized. The FTAA effort effectively drew on Latin Americans’ anger and frustration following years of structural adjustment, austerity, privatizations, and deregulation, and built on a growing anti-imperialist consciousness. It was able to channel the energies of the groups already mobilized on these issues into the FTAA campaign. Although today’s political context is very different, connecting our analysis and messaging on the TPP to the concerns of current movements in the TPP countries will help to maximize our power. Examples include the labor movement working on issues of inequality, jobs, and the minimum wage; groups mobilized on issues of digital privacy in the wake of the NSA scandal; student movements in Chile, Mexico, and the United States; and the environmental movement mobilized around the Keystone XL pipeline and fracking in the United States, tar sands in Canada, nuclear power in Japan, coal campaigning in Australia, and climate change everywhere. Another related lesson is the importance of making the abstract concrete. The FTAA campaign effectively connected analysis of hard-to-understand and seemingly irrelevant aspects of the draft texts — such as investor-state dispute procedures — with specific concerns of different domestic sectors. Now that the final text of the TPP is available, there’s an urgent need to do the same. That means, for example, communicating to public health advocacy groups and health professionals’ organizations about how intellectual property provisions and extended patent protections for pharmaceuticals will affect access to medicines. It means making it much clearer for the environmental movement how energy and climate legislation — such as restrictions on fracking, coal, and nuclear power — could be undermined by investor-state lawsuits, like the $15 billion suit just launched against the US government for blocking the Keystone XL pipeline. And it means showing small and medium-sized business associations how restrictions on procurement will prevent governments from favouring local producers. ISDS was a key issue in provoking outright rejection of the FTAA. Now, over ten years later, we have much more evidence to demonstrate, in very concrete ways, the risk that this system represents for a wide array of urgent public issues. With the high profile of the ISDS issue in Europe currently, there is a multitude of quality, accessible campaign materials that can be used to this end — including a diverse array of voices, from conservative think tanks to trade unionists, joined in unlikely alliance against it. Finally, we should note the importance of creating alternative proposals. The anti-FTAA campaign was very clear that they were not against the integration of the Americas. Rather, they proposed a different kind of integration that was not based on the interests of corporate profits, unhindered competition, and a race to the bottom. While regional integration in Latin America has been slow, if the FTAA had been signed it may well have made these initiatives impossible, as regional economies would have been pulled even more tightly into Washington’s orbit. Obama was quite explicit about his intention to re-write the rules for international trade in these new deals. Highlighting the geo-strategic implications of the TPP, including the potential impact on alternative regional integration processes in Asia and Latin America, may also give us some leverage at the domestic level. The FTAA campaign undoubtedly holds valuable lessons for our current efforts. However, what happened in Latin America subsequently — when corporate power regrouped and went on the counterattack in the face of a weakened civil society — tells us something even more important about the nature of the challenge we face. Even if we defeat the TPP, challenging corporate power is like playing whack-a-mole: it will find other ways to expand. So while we fight our local battles, and continue building a globalized movement of local struggles, we mustn’t lose sight of this bigger question about how we dismantle corporate power. The calls for a restructured, fairer global economy are growing louder by the day. While we have our mallets poised and ready, we also need to continue planning how to put the mole out of action for good. Aldo Orellana López and Thomas Mc Donagh are researchers at the Democracy Center in Cochabamba, Bolivia.